Warp weasels. Why did it have to be warp weasels? As any dashing and resourceful starship captain can tell you, the vast emptiness of outer space is not nearly as empty as you'd expect. It's overstuffed, in fact, with hostile aliens, space pirates, energy beings, dimensional rifts, evil robots, telepathic monsters, and of course, a horrifying array of deadly and disgusting space diseases. Orion Trail is certainly no exception. It's currently in the midst of a Kickstarter campaign, and as of today it's about a third of the way to its goal. The prototype of the comedy sci-fi game, which you can play for free in your browser, is closer to Galaxy Quest than Star Trek and more Choose Your Own Adventure than FTL. After selecting a captain, officers, and a ship, all with varying scores in attributes like tactics, diplomacy, science, and bravado, you must survive a westward trek across your screen while managing food, fuel, crew size, and ship integrity. Along the way, you make your best guess as to how to deal with the randomized encounters routinely teleported into your space-lap. Warp weasels, for instance. My ship was infested with them in an earlier (failed) voyage, and based on my crew's attributes, I assigned my science team to deal with them. They chose to use a prototype weasel spray, but after failing a dice roll, they accidentally used a weasel aphrodisiac. This sent the weasels into an amorous frenzy, resulting in a number of holes being punched (or perhaps humped) in the ship's hull. Thanks, science team! How to handle them this time? Try to shoot them? Attempt to domesticate them? With my current crew, my science rating is still my best bet, so I reluctantly hand the decision over to my biotech team. This time they decide to release a fungus into the ship's air vents. It kills the weasels handily, but the fungus also wipes out all of our elderly crew members. Partial success, then. We've lost a portion of the crew, but gained some food (because we roast and eat the dead weasels). Alas: I have 99 space problems, and warp weasels are just one. Earlier, my ship's computer became self-aware (as computers tend to) and wanted to abandon the mission, thinking it had nothing more to learn from humans. How to convince it to stay? Well, I fed my crew a supply of spicy nutri-paste, leading to ship-wide flatulence, and the computer, unable to determine why flatulence is so funny to humans, decided it still had a thing or two to learn and remained on board. We lost food (by stuffing ourselves with all that paste) but gained a few points of bravado for designing such a bold, fart-based plan. Kirk would have done the same, I bet. Picard? Probably not. He probably has his farts discreetly beamed out of his body and into a black hole. Later, while visiting a space colony, we discovered the population was under the control of a psychic alien yeti. After a negotiation, the brain beast was willing to release a few colonists, which we added to our crew, in exchange for some childhood memories for the yeti to chew on. Works for me. The less I remember about my childhood, the better. I've seen a monster lurking in a black hole, I've traveled back in time to correct my past mistakes, I've engaged in a little shipboard romance, and several times my crew has come down with a nasty case of Tentacles Growing Out Of Them. We even once ran into a version of ourselves from an alternate dimension. They were evil, naturally, but seeing as how most of my crew was also evil, they wound up joining our mirror-world counterparts and ditching me. All in a day's space work, I suppose. It's just a shame that, time after time, the day's space work comes to an end by starving to death, running out of fuel, or losing my entire crew to various disasters. Finally, I hit a run of good luck. A few favorable dice-rolls, a series of challenges my crew is well-equipped to handle, and a lack of warp weasels means I actually reach the left edge of the screen. I complete my mission with food to spare, just enough fuel, my ship only missing half its hull, and while my crew has no doubt gained some terrible memories (or surrendered some fond ones to the psychic yeti), many of them are in a state that can be described as 'not dead'. In the vastness of not-at-all-empty space, that's the best a captain can hope for. 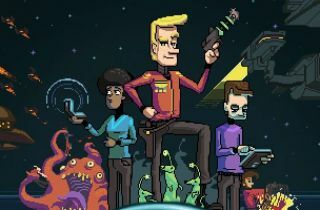 You can choose your own space adventure with Orion Trail's prototype here, captain.